The Fort Collins’ ballot measure that could amend the City Charter allowing high-speed Internet to become a municipal utility moves forward after a short legal scuffle. The question will be decided at the November 7th special election. After the language of the ballot question was released following approval by City Hall, local activist Eric Sutherland filed a petition with Larimer County. Sutherland — well known for his numerous petitions wagered against the city, county and school district— claimed that the language “failed to consider the public confusion that might be caused by misleading language”. Sutherland also insisted the proposed City Charter Amendment isn’t legal under the Taxpayer's Bill of Rights (TABOR) amendment to the State Constitution. TABOR requires local governments to get voter approval to raise tax rates or spend revenue collected under existing tax rates. Attorneys representing the city of Fort Collins rejected Sutherland’s claims and maintained that the amendment isn’t covered by TABOR. A utility does not require voter approval to issue debt because it is legally defined as an enterprise, a government-owned business. Moreover, Fort Collins Chief Financial Officer Mike Beckstead testified that the bonds would be backed by utility ratepayers, not tax revenue. City Council explained in a statement that they included the $150 million-dollar figure in the ballot language in an effort to maintain transparency and show the level of commitment a broadband utility could require from the municipality. By including the dollar amount in the ballot language, the Charter would also establish a limit on any debt. The town of Erie, Colorado Board of Trustees has commissioned a consulting firm to conduct a $65,000 Municipal Broadband Assessment and Feasibility Study. The vote allocated funds to explore options for the town’s growing connectivity needs of residents, local businesses, and municipal services. According to the Request for Proposals (RFP) for the Municipal Broadband Assessment and Feasibility Study, the consulting firm will conduct a survey to measure local support for the town to invest in a community owned fiber optic network. In 2012, Erie conducted a similar residential survey, which reported that “63% of residents supported or somewhat supported efforts” for telecommunications projects. Erie is situated in both Weld and Boulder County and is just 20 minutes northwest of Denver. According to the Town of Erie’s 2017 Community Profile, the current population is approximately 25,000 residents with over 7,000 homes but local officials expect both to grow over the next five years. By 2020, community leaders expect the population to increase by 10,000 and the number of homes to increase by more than 50 percent. Before Erie can make investments in publicly owned Internet infrastructure, voters must pass a referendum to opt-out of Colorado Senate Bill 152, which prohibits local governments from either supporting directly or indirectly any advancement of telecommunication services to subscribers. Eagle County and the city of Alamosa are both putting forth an SB 152 opt-out question to a vote this fall. Early last year, the city of Steamboat Springs in Colorado took advantage of an opportunity to expand from an earlier public infrastructure investment. A state grant has allowed them to connect five community anchor institutions for better connectivity and cost savings. In 2016, the Colorado Department of Local Affairs (DOLA) awarded the community $748,000 toward the cost of a fiber backbone across the length of the city. In order to complete funding for the $2.22 million project, the city and its other partners, the Steamboat Springs School District, Routt County, Colorado Mountain College, Yampa Valley Electric Association (YVEA), and Yampa Valley Medical District contributed matching funding. Five community anchor institutions (CAIs) are now connected to the backbone, including the local U.S. Forest Service and Colorado Parks and Wildlife offices, the YVEA offices, and the school district building. The school district is also housing the communities publicly owned Carrier Neutral Location (CNL), which the city created in 2014. The CNL is a space owned by a neutral party - in this case the Steambot Springs School District city of Steamboat Springs - where broadband providers can connect to each other. Middle mile and last mile providers can connect to each other in these “meet-me rooms.” The partners in Steamboat Springs are saving because they’re paying less for bandwidth and, because the school district is hosting the meet-me room, there is no need to pay for a separate facility. 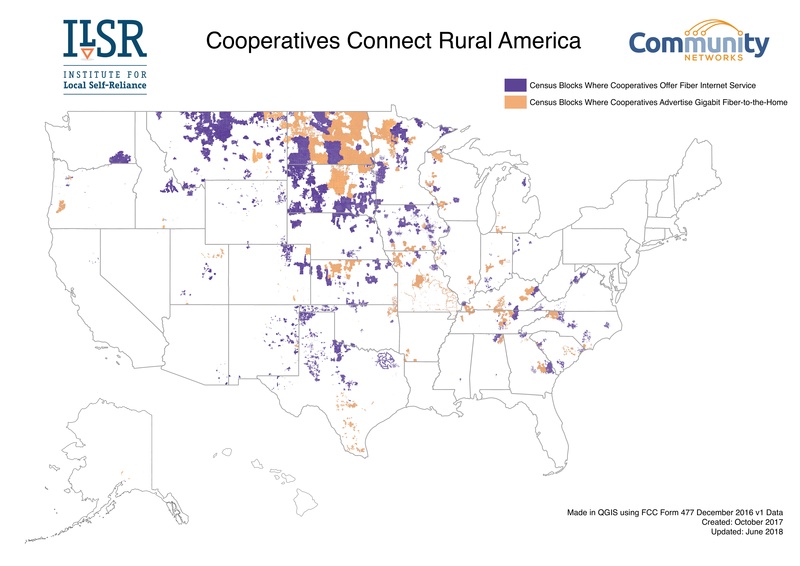 In Steamboat Springs, Northwest Colorado Broadband connects with Mammoth Networks. Community leaders hope the presence of the CNL and the fiber backbone will attract last mile providers to invest in Steamboat Springs so residents and businesses can obtain better connectivity in the future. As predicted, more Colorado communities are opting out of the state’s restrictive SB 152 that removed local telecommunications authority in 2005. Two more communities have decided to put the question to voters this fall in order to take the reins and reclaim local control. There are about 53,000 people living in Eagle County, located in the northwest section of the state. The County Commission had considered taking the matter to the voters last fall, but considered the ballot too full with other measures. The town of Red Cliff within Eagle County voted to opt out of the law in 2014. County officials have included telecommunications in their legislative policy statement supporting their intent to reclaim local authority and bringing better connectivity to both urban and rural areas of the county. Eagle County encompasses 1,692 square miles; much of that is managed by the Bureau of Land Management. There are several national protected areas within the county. They haven’t established a plan to invest in publicly owned Internet infrastructure, but first want to deal with the issue of opting out of SB 152. Alamosa, county seat of Alamosa County, is also planning on bringing the issue to voters this fall. Like many other communities that have voted to opt out, Alamosa doesn’t have specific plans to invest in infrastructure yet, but they want to have all options on the table. They’re interested in using existing city owned dark fiber and conduit and exploring possible public-private partnerships, but they’ve not ruled out offering direct services. In a few of the public areas, Alamosa intends to offer free Wi-Fi while they look into possible solutions. Alamosa is in south central Colorado and home to approximately 8,800 people. The climate is a cold desert where the Rio Grande River passes through town. More than half of county residents live in the city. In an exciting milestone, this is podcast 100000000. Or 256 in decimal - you know, for the squares. While at the always-amazing Mountain Connect event in Colorado, I snagged an interview with Doug Seacat of Deeply Digital and Clearnetworx. They sought a grant from the Colorado Broadband Fund to deploy fiber and wireless to underserved Ridgway in western Colorado. What happened next is shocking but hardly an anomaly. Using what is often called the "Right of First Refusal," where incumbents get to prevent competition in state broadband programs, CenturyLink not only blocked Clearnetworx from getting the grant but got itself a hefty subsidy for a very modest improvement in services. Ridgway residents went from almost certainly having a choice in providers and gigabit access to seeing their taxpayer dollars used to not only make competition less likely but also effectively blocking the gig from coming to everyone in town. In this interview, we discuss the details. This show is 20 minutes long and can be played on this page or via iTunes or the tool of your choice using this feed.